Montichiari/Hannover. This year will mark the 16th time that REAS, Italy’s leading trade show for the rescue, disaster relief, fire protection, security and safety sectors, will open its gates to trade visitors from around the world. Based in Montichiari near Lake Garda, the show will feature all the latest technologies and solutions. With the support of Deutsche Messe, which also organizes the EDURA fair for the Eastern European market and the AFAC show in Australia, REAS powered by INTERSCHUTZ has gone from strength to strength in recent years. In 2015, the Italian-based event attracted over 22,000 industry professionals – a nine percent increase on the previous show. Given the world’s continually mounting security challenges, the organizers expect a similar increase for this year. One of the key attractions of REAS powered by INTERSCHUTZ is the show’s supporting program of workshops, which represents a unique opportunity for the participants to further their knowledge of the latest trends and developments. A case in point and a major highlight of the upcoming show is the newly developed “DIEM-SSP” simulator. “DIEM-SSP” stands for “Disaster and Emergency Management for Safety and Security in Industrial Plants.” The system provides ultra-realistic simulations of catastrophic incidents in large-scale industrial plants and so-called critical infrastructures – essentially any facility the destruction of which would have far-reaching consequences for the local population. Visitors to this year’s REAS powered by INTERSCHUTZ will be able to try the “DIEM-SSP” simulator out for themselves and learn how to respond and make snap decisions in complex disaster situations where time is of the essence. The results generated by each training session as well as the participants’ feedback will then be used by the developers to further optimize the simulator. Headed and coordinated by a group of scientists from Brescia University’s engineering faculty, “DIEM-SSP” is a joint project between a number of research institutions and Italian universities. It is financed by the Italian Ministry of Education, Universities and Research’s PRIN fund. 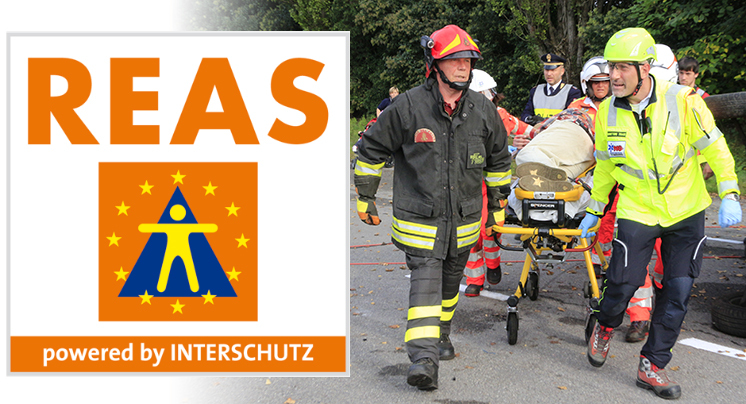 REAS powered by INTERSCHUTZ 2016 will showcase the full range of solutions for today’s challenges in the firefighting, fire protection, disaster relief and rescue services sectors. Other key themes covered by this year’s show include emergency pediatrics strategies following major disasters, further education and training for ambulance drivers, and ultra-realistic training exercises for firefighters. The exhibits and events at the upcoming show promise to be every bit as spectacular as they are edifying.